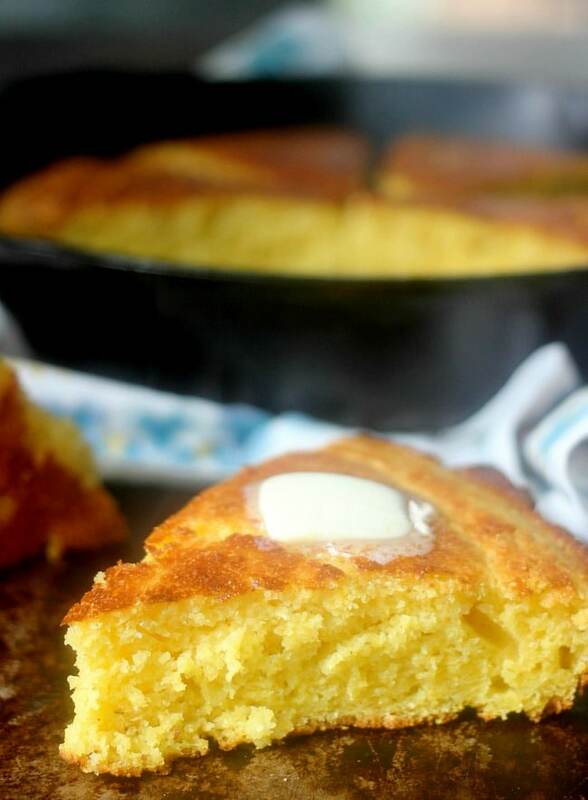 This easy and moist cornbread recipe is a true southern treat made with tangy buttermilk and cooked in a cast iron skillet to achieve that iconic crispy bottom. This one bowl recipe is incredibly versatile and is a great base recipe to create endless variations! Let’s get this out of the way upfront, I am not from the south. I am a Midwesterner who loves to bake and who is a student of baking things the “proper way.” I feel as though I must brace myself when I write recipes that are tied to as much history and passion as cornbread. I know I might ruffle some feathers, but I’m going to try my best not to! What I can say is that I have read and tested a lot of cornbread recipes. I’ve tried ones with only cornmeal and no flour. I’ve tried ones without a drop of sugar. I’ve tried ones with equal amounts of flour and cornmeal. And I’ve tried just about every variation in between. Through all of this testing, I have developed this recipe that I believe to be the best. It is an incredibly moist cornbread recipe that uses mostly cornmeal with a little bit of flour, a good amount of butter, just a drop of sugar (stay with me, we’ll talk about it! ), and definitely buttermilk! First things first, let’s talk about the cornmeal. If you want to make a truly exceptional cornbread then a really high quality cornmeal is going to be key. After all, the cornmeal is the star of the show here! If you can find it, fresh stone ground cornmeal from a small mill is really going to give you the best results. I have made cornbread with this Palmetto Farms Stone Ground White Cornmeal and it was just fabulous! Such an incredible difference between this and the cornmeal we find in most stores. But let’s be real, we don’t all have access to beautiful fresh ground cornmeal. Even in Chicago, I checked multiple specialty stores and all of them carried the same brand and none from smaller mills. So I tested this recipe with generic cornmeal because I want it to taste great for whoever is making it with any kind of cornmeal. Moral of the story here, this recipe will be good with any cornmeal you are able to use, but it will be better if you are able to find great cornmeal. Does Flour Belong in Cornbread? I have tested recipes without any flour, some with a little flour, and some with a fairly high percentage of flour. In my opinion I think a little bit of flour with a much higher percentage of cornmeal is the perfect balance. A small amount of flour really does wonders for the texture of the cornbread, especially cornbread made with average cornmeal, while still highlighting the cornmeal as the star ingredient. This recipe calls for a 4:1 ratio of cornmeal to flour which I believe is the perfect balance. Talk to a true southerner and likely they will tell you sugar has no place in cornbread. I have to say, I understand where they are coming from. Traditionally, cornbread is a savory side dish and recipes calling for a great deal of sugar in the bread are taking a big deviation from the classic recipe. It is important to note however, that access to really high quality stone-ground cornmeal that was available when the original cornbread was being made, when no sugar or wheat flour was used, is just not as readily available today. Robert Moss wrote a fascinating piece that goes more into the history of cornbread and its evolution if you care to learn more about this topic. Corn, in and of itself, is slightly sweet. The problem is that most cornmeals today are made with corn that is not quite mature yet. This means that the corn hasn’t fully developed its flavor and sweetness. I find that a small amount of sugar really helps balance the flavor of a cornbread that is made with generic cornmeal and actually enhances the corn flavor. I promise it won’t taste sweet. Tip: The amount of sugar called for in this recipe is not going to make the cornbread taste sweet, but I am a firm believer in cooking and baking to your own preferences. If you are a person that prefers a sweet cornbread then by all means make your cornbread sweet! You are the one eating it! The sugar in this recipe can be increased if it is what you prefer! Buttermilk serves two purposes in this recipe: to help flavor the bread, and to react with the baking soda to tenderize and make the bread rise. The tangy flavor the buttermilk brings to this cornbread is really quite nice and rounds out the flavors. If you do not have buttermilk on hand, then you can easily create a substitute by mixing regular milk with a bit of lemon juice or white vinegar. You can also thin out sour cream or plain yogurt with a bit of water until it is the consistency of buttermilk. See the recipe notes for exact amounts for these buttermilk substitutes. 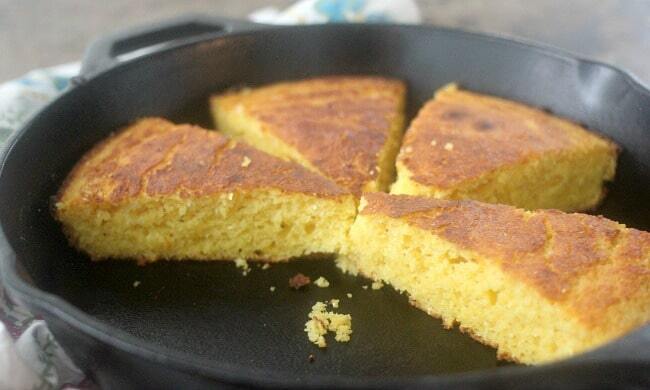 Traditional cornbread is cooked in a preheated cast iron skillet. The biggest benefit of cooking this cornbread in a cast iron skillet is that it goes into the oven while you are making your cornbread batter and gets very hot. Then, when you pour the batter into the skillet it immediately starts to heat up on the bottom and becomes very crispy. There is just nothing better than a good crispy crust on the bottom of a tender and moist cornbread. If you don’t have a cast iron skillet then you can definitely bake this in a 9″ round cake pan or pie plate or a 9×9 square dish. Just be aware that it will not have the same iconic crispy bottom as it would if cooked in a cast iron skillet. And I highly recommend adding a cast iron skillet to your kitchen. You will not regret it! This recipe can be made into cornbread muffins if you prefer. Grease a muffin pan or line with muffin liners and divide the batter into 12 muffins. You just want to reduce your baking temperature to 400F (204C). See recipe notes for more details on making cornbread muffins. Since the butter is being melted for this recipe already, might as well go ahead and brown it! You know how much I love brown butter in baked goods! Whenever you are using brown butter in place of regular butter in a baked good, you must increase the liquid ingredient by 2 TBSP per 4 oz (1 stick) of butter you browned. See recipe notes for more details on making brown butter cornbread. All you have to do to flavor this cornbread is to throw in anything you want at the end! Add a generous amount of shredded sharp cheddar cheese and some minced fresh jalapeno right before it goes into the skillet! See recipe notes for more details on making jalapeno cheddar cornbread. Pieces of crumbled crispy bacon studded throughout this cornbread mixed with some scallion is also an amazing idea! You could also save that rendered bacon fat to use in place of some or all of the butter if you really want to go for it! And you should! See recipe notes for more details on making bacon and scallion cornbread. Position your oven rack in the center of the oven and place a well seasoned 10" or 12" cast iron skillet inside. Preheat your oven to 450F (232C). 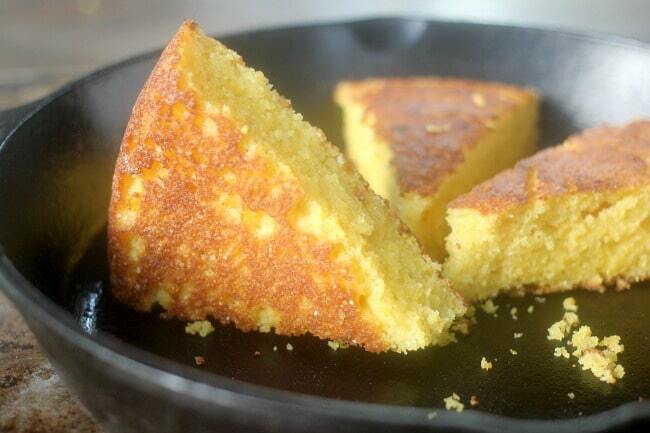 This will preheat your skillet to help achieve a very crispy bottom to your cornbread. Alternatively, if you do not have a cast iron skillet you may use a 9" round or square metal or glass baking dish for this recipe, but you should not preheat them in the oven. Meanwhile, melt your butter. Once completely melted, divide out about 2 TBSP. This will be used to grease your skillet. The rest of the butter will go into the cornbread. Set both aside to cool slightly. In a large mixing bowl combine the cornmeal, all-purpose flour, baking soda, baking powder, salt, and sugar. Whisk together until combined. Add in your buttermilk, eggs, and the larger amount of melted butter and stir until everything is just incorporated. You don't want to over-mix. Carefully remove the hot cast iron skillet from the oven. Add the 2 TBSP butter you divided out to the pan and swirl around until the bottom is coated. Pour your cornbread batter into the skillet and immediately place skillet back into the hot oven. If you are using a baking dish instead of a cast iron skillet, coat it with the reserved melted butter. Cook at 450F (232C) for about 20 minutes or until a tester comes out with moist crumb from the center. If you want a crispier top, put it under the broiler for 1-2 minutes, watching it very closely. Butter: If you only have salted butter, it can be used in place of the unsalted butter in this recipe, however you should decrease the amount of salt added to the recipe to 1 1/2 tsp. Sugar: The amount of sugar called for in this recipe will not make this a sweet cornbread. It only serves the purpose of balancing the flavors. If you prefer a sweet cornbread, you can increase the amount of sugar in this recipe to 2/3 cup and reduce the amount of salt to 1 tsp. You could also choose to just increase the sugar by a small amount for just a slightly sweet cornbread. Buttermilk: The acidic properties of buttermilk are necessary in this recipe to activate the baking soda. If you do not have buttermilk you can make a substitute by measuring out 1 1/2 TBSP of white vinegar or lemon juice and adding enough regular milk to equal 1 1/2 cups. Stir and let sit for 5 minutes before using. As another option, combine 1 cup plus 2 TBSP of sour cream or plain yogurt with 6 TBSP of water and use in place of the buttermilk. Cornbread Muffins: Grease or line a muffin tin and divide the batter between 12 muffins. Reduce the oven temperature to 400F (204C) and bake for 18-20 minutes or until cooked through. 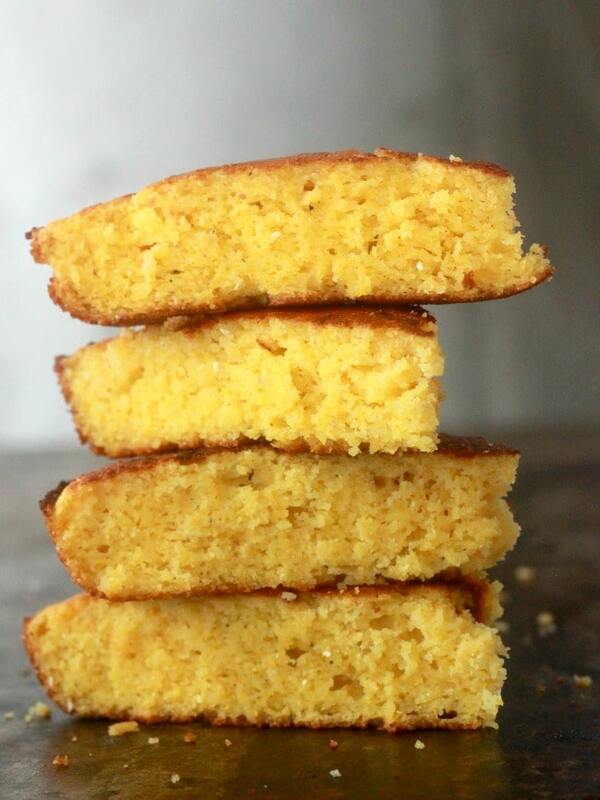 Brown Butter Cornbread: Melt the butter in the recipe in a saucepan over medium heat. Stir continuously until the butter starts to become brown in color and smells nutty. Proceed with the recipe, but add an additional 2 TBSP of buttermilk to the recipe. Jalapeno Cheddar Cornbread: After your batter is made, stir in 6 oz shredded sharp cheddar cheese and 2 TBSP minced fresh jalapeno. Bacon and Scallion Cornbread: Cook 6 strips of bacon until crispy. Crumble and set aside. Pour off the bacon fat to use in place of butter. Depending on how much your bacon rendered you may need to add some melted butter to make up the difference. Proceed with the recipe and stir in the crumbled bacon and 1/2 cup thinly sliced scallions. A good handful of sharp cheddar wouldn't be a bad addition to this one either! Love how the detail and number of variations you provided! This looks so delicious!! I haven’t made cornbread in way too long. Hey Laura! I hadn’t either until the last two weeks when I made maybe 20 batches! HAHA! I forgot how much I loved it! As you know from the review I submitted, I love your blog. I, too, have tried countless cornbread recipes because cornbread has always been my family’s “bread of choice.” Our by-miles favorite recipe is similar to yours, and have been asked for the recipe many times. Three non-negotiable secrets to the best cornbread: 1) good thick fat buttermilk (no substitutes), 2) a small portion of your total cornmeal should be coarse-ground to give it a bit of gritty chewiness, and 3) bacon grease pre-heated in the cast-iron skillet. You are absolutely right that good cornmeal makes the difference. 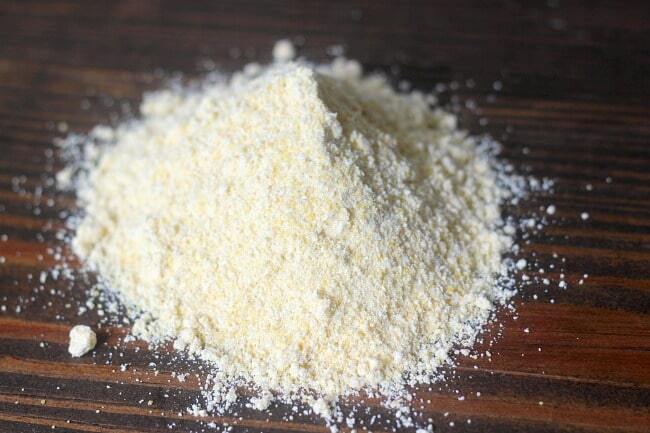 Most store-bought cornmeal is too finely ground and lacks the flavor of mature corn. I try to use fresh locally milled cornmeal, but when I can’t get it, I use Aunt Jemima yellow, and regardless, I always include just a small handful of coarse-ground meal from Bob’s Red Mill. I love this, Robin! I can tell you are an absolute pro when it comes to making outstanding cornbread. Thanks for sharing your tried and true tips! This is nice cornbread, I just made it. I agree, the different cornmeals yield different results and I would have liked a slightly finer grind on mine (it was Bob’s Red Mill). I do have to say….always always always grease my cast iron with bacon grease for cornbread. It’s a requirement. 🙂 Never butter. Your video recipe doesn’t match your written one on the website….1 1/2tsp baking powder vs 1tsp in written and 4oz butter vs 5…i followed the video…we’ll see what happens. Thank you for bringing this to my attention, Julia. My apologies for the confusion! The quantity of the butter is divided – 4 ounces in the batter and 1 ounce in the skillet. I’ll be sure to update the baking powder quantity to 1 1/2 teaspoons 😉 Hope your cornbread was delicious! This didnt turn out so well for me, i found it to be very bland. So sorry to hear that, Nancy! Please let me know if I can help you troubleshoot the recipe in any way! FYI your gram measuremeants are very wrong. Had to take it out of the oven and redo when I realized something didn’t seem right. I just double checked and the gram measurements are accurate. What did you think didn’t seem right? It will be a thick batter consistency. I took a sight shortcut. I put my butter into my cast iron skillet while it heated in the oven to melt instead of stove top or microwave. Ended up with brown butter!!!! Turned out fabulous! I love unsweetened cornbread, can this recipe be made but omitting the sugar? I don’t like sweet cornbread plus I’m sure there are a lot of people that like unsweetened cornbread! Hi Teri! I address this pretty in depth in the article for this recipe as well as the notes for the recipe. This is not a sweet cornbread. 2 TBSP of sugar is not enough to make it sweet, rather it balances out the flavors. I tested this recipe many times without sugar and found it always tasted flat. However, I life in Chicago where I am not able to easily find very high quality cornmeal that is made from corn in its peak season. If you do have a very high quality cornmeal, you can likely get away with leaving the sugar out. I just found that a tad of sugar in general made a cornbread that tasted more like corn, if that makes sense. Hi Carolyn, So glad the cornbread was enjoyed! Can I ask which brand of salt you used? Sorry turned out to be a crumbled mess. Will not make again. Don’t recommend this. Hi Elka! Sorry to hear this didn’t work out for you! Since this is a tested recipe made many times with success, I’d love to help troubleshoot and see where it may have gone wrong for you. It sounds like you may have ended up with too much dry ingredients in your batter. Make sure when you measure your cornmeal and flour that you lightly spoon it into your measuring cup, being extra careful not to pack it in at all, and then level it off. Hope that is helpful! Can you substitute honey for the sugar? Would that change the mix of dry ingredients if you did? Also I need to make this gluten free, does it really change the recipe to omit the flour? Hi Tamara, yes you can substitute the honey for the sugar with no issues. As far as omitting the flour, your ratios will be off and you will need to adjust. It will also be much more crumbly without the flour. I would suggest substituting the flour for 1/4 cup of cornstarch instead of omitting all together. Hi! I was just wondering where I can find the notes on buttermilk substitutions? It’s an uncommon thing here in Canada, so I’d love to find out what proportions I would need for the alternatives, thanks! I missed saying I substituted bacon grease for the butter. I made 2 batches yesterday. One in a cast iron skillet, the other in my cast iron Dutch oven. Hands down the best cornbread ever. I used Bob’s Red mill cornmeal. 1/2 medium grind & 1/2 coarse (not polenta). It was so moist & flavorful & got rave reviews from everyone at the party. I did use 1T white balsamic vinegar in Strauss whole milk instead of buttermilk. I’m so glad you enjoyed it Stephanie! That’s so great to hear! After making many recipes of Skillet cornbread, this is by far my favorite and the most Dependable. No changes. I love it! That’s so great to hear Sally! So glad you enjoy it! This was my first time making cornbread from scratch and it worked out pretty well for me. Thanks for all the detailed explanations on the different options and how you landed on the recipe. I’ll probably try adding jalapeños next time. I have a few questions for you though, what can I do to make it more moist? It came out a bit too dry for me. Do I pull it out earlier? Increase butter and/or buttermilk? I think all my ingredients were good quality, other than maybe the buttermilk. All I could find was Garelick “Reduced Fat Cultured Buttermilk”. I’ve never bought buttermilk before so wasn’t really sure what to look for. I used Kerrygold unsalted butter, Bob’s Red Mill medium grain cornmeal, gold enriched all purpose flour.